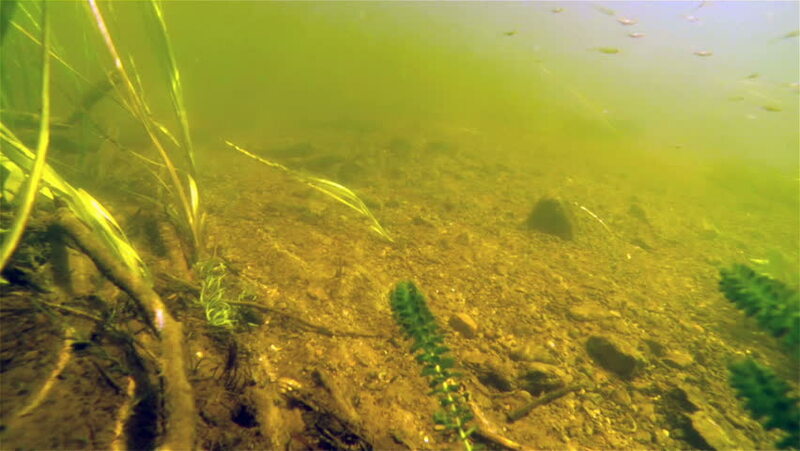 An underwater view of the lake floor with plants and some broken wooden sticks. Thriving plants living underwater with the ray of the sun reflecting underneath. hd00:36Underwater footage. Details of submerged reefs, covered with Seaweed, Sea lettuce and similar water vegetation. South Black Sea coast. hd00:15Underwater close-up shot of sedimentation over over Littorella uniflora shoreweed bottom-leaved vegetation in a lake in Finland. hd00:20Ribbon-like algae swaying in waves near water surface in a freshwater lake. 4k00:56Underwater green grass carpet with small unkown fishes and a White seabream (Diplodus sargus) pass by the scene. Video made in the Mediterranean Sea in Sicily, Italy.